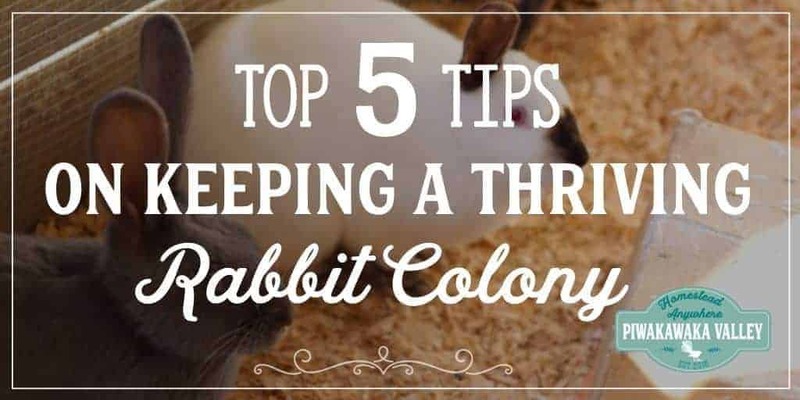 Colony Rabbits: Raising rabbits in a colony is the best way to ensure happy, healthy, natural rabbits. Our animals live a stress free life, with plenty of healthy, natural food, fresh water and sunshine. 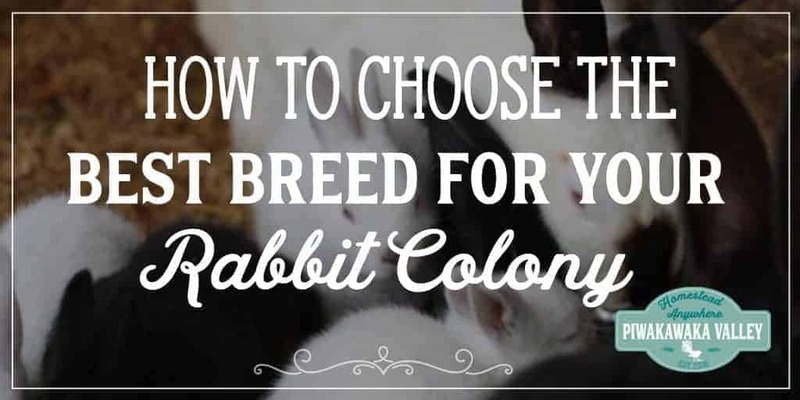 We have put together a comprehensive guide to raising meat rabbits in a colony to get you started on your way to raising your own colony of rabbits. WARNING: These pages discuss housing, rabbit diseases and raising of rabbits for human consumption and contains graphic pictures. If this topic disturbs you, please do not proceed. How Do I Stop The Rabbits Escaping? 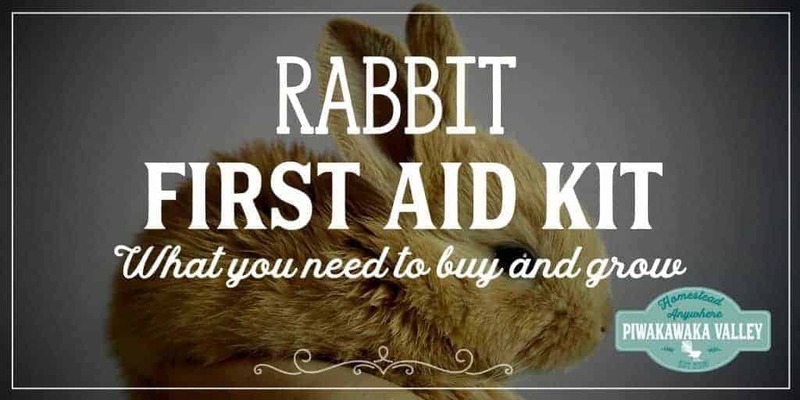 Why you should consider raising meat rabbits. 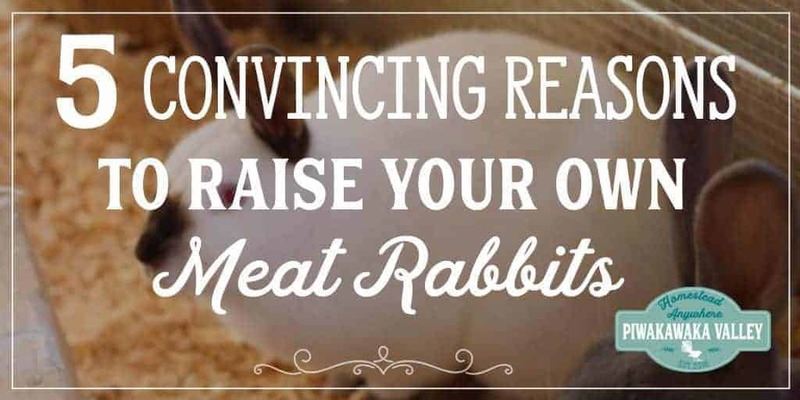 There are many reasons you might like to raise meat rabbits at your place. 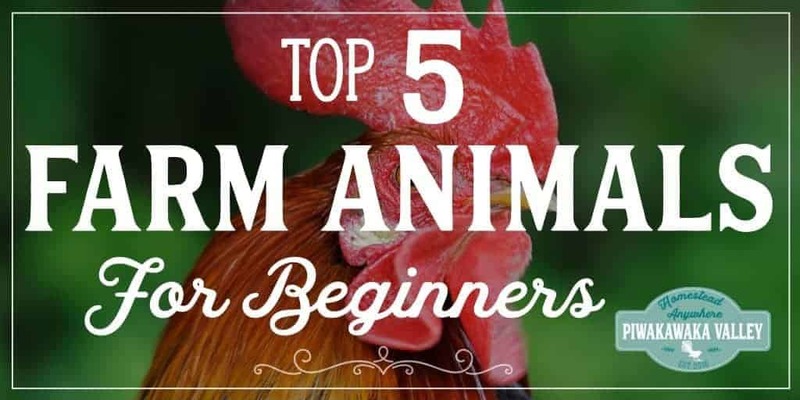 They are a sustainable protein source, and they reproduce like rabbits! Their meat is healthy and it is pretty tasty. A trio of rabbits can keep a family of 4 fed with 1-2 meals a week of rabbit and they take up very little room. Meat rabbits are quiet, and are considered pets so you can keep them within city limits. 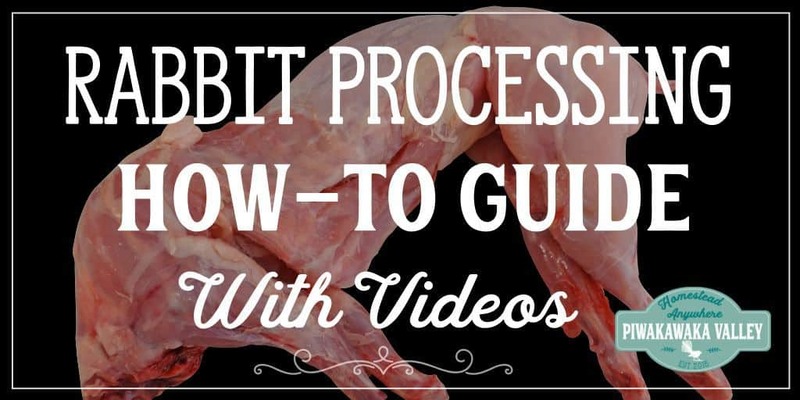 Rabbits are easy to process, and can be used in a variety of dishes. There is very little start up cost involved in owning meat rabbits. 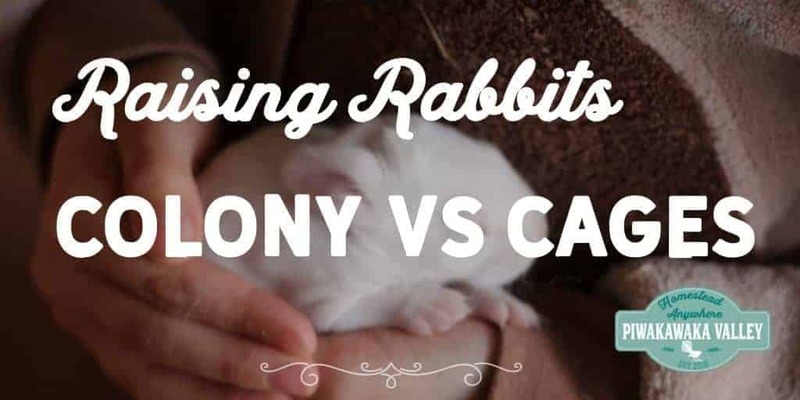 Related: Colony rabbits vs caged rabbits and why we have chosen to colony raise our meat rabbits. 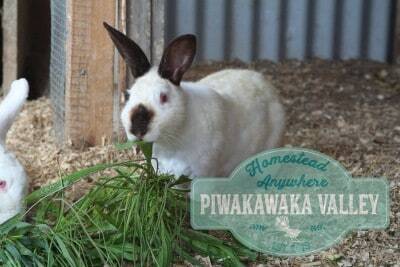 There are 5 pretty common choices for breeds of meat rabbits. However by far the top of the pile is the New Zealand White, which was actually developed in America! New Zealands also come in red, blue and black, however in New Zealand, we can only get the white variety! 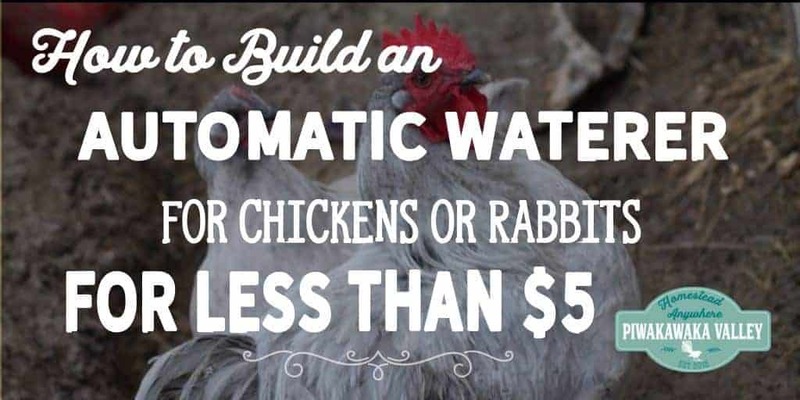 If you are planning on colony raising your rabbits (highly recommended!) I do suggest you try and find a breeder near you that also colony raises. 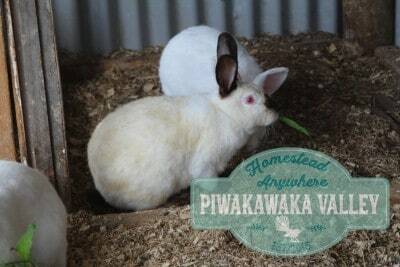 You can move caged/older rabbits into a colony, but they seldom thrive the same way colony-native bunnies will. Our rabbits we got from cages, but they were quite young and adaptable when we got them, so they have taken to it with flying colors. There are some breeders working towards disease resistance in their colonies, so that is another thing to consider. Rabbits from proven meat lines, with good chunky square form, are more desirable than one that happens to have a pedigree. The top 5 options are NZ whites, Californians, Satins, Silver fox (American), and Florida white. Coming in behind are the giant breeds like the Flemish and the Continental. 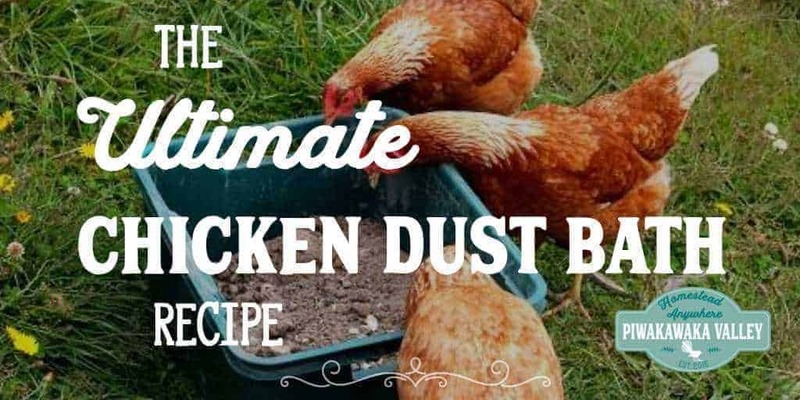 The giant breeds are no bigger than the medium sized breeds at 8-12 weeks and have much more bone to meat ratio, so aren’t as productive as you might think. They do make a good cross breed however. + A shed: rabbits are housed indoors on the floor in a building, either on concrete, wood or earth. 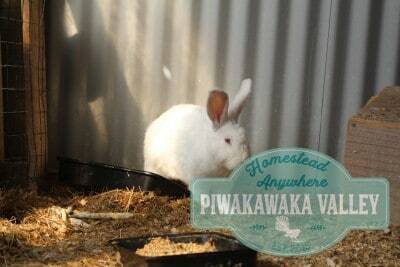 + An outdoors colony: Rabbits are provided with an outdoor area with hides/houses and the ability to dig burrows. Obviously you will have to choose what works well for you. Rabbits need a minimum of 10 sq ft (1sq meter) per buck and 20 sq ft (2 sq meters) per breeding doe. The larger area for the does allows for their grow outs up to 12 weeks of age. You will need several feed stations, preferably undercover to protect the feed from the weather. Sheds do well with a deep litter system, where you keep adding dry material to the top layer of the flooring. Once the material gets deep, you dig it all out and start fresh. 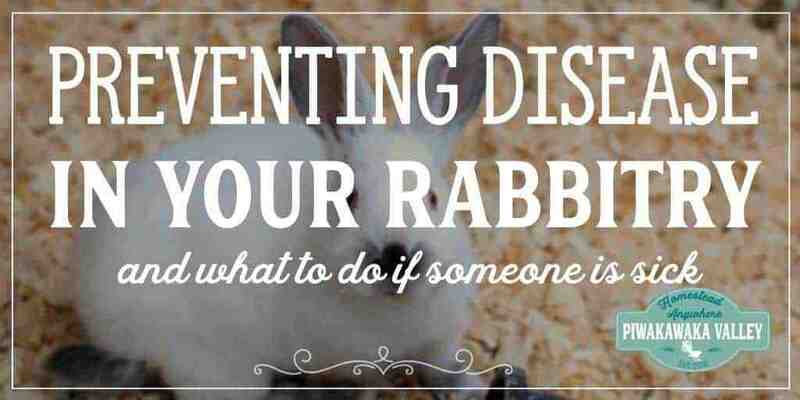 New rabbits should be quarantined for 30 days. Ideally when starting a colony, all the rabbits should be added at once. This minimises the fighting as they are all a little confused. 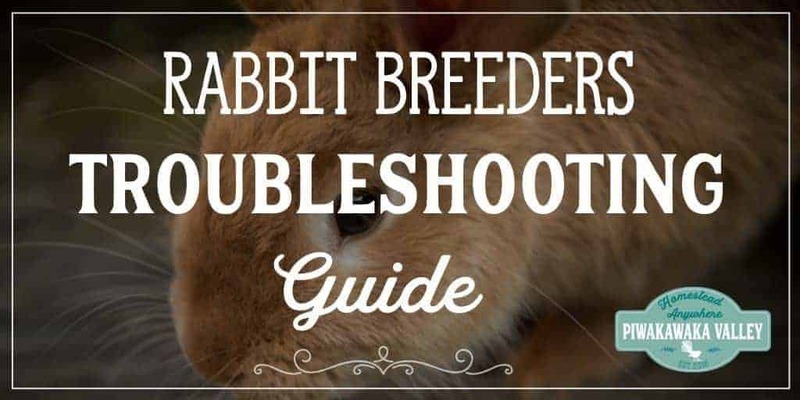 It is usually recommended that you wait until 6 months for small-medium breeds, 9 months for large and 12 months for giant breeds for breeding rabbits. However, I have a different standing than most on this issue. It is often considered expected that you will lose most, if not all of a mother’s first litter. However if you breed does at 16-17 weeks you can prevent lost first litters. Breeding rabbits younger results in less than 1% litter loss on the first litter. Compare it to roughly 90% first litter loss on does bred later. Once you get your does switched over to breeding younger litter losses are almost non existent. So there you go, let them breed like rabbits for best results. Many colony owners simplify breeding their meat rabbits by simply leaving the buck in with the does all the time. This means that the does naturally regulate their breeding patterns, often taking a break over the heat of the summer. As long as the doe is in good condition, breeding her back to back is not detrimental to her health. Infact with good nutrition, rabbits are designed as breeding miracles, and will naturally keep reproducing. If you prefer to control who breeds with who, you need to keep the buck in separate quarters, and either set him loose with the does for a week now and again, or take each individual doe to his cage. If the doe is receptive, they will get right to task. If she is not receptive, try again tomorrow. Pregnancy usually lasts about 28-31 days. Does with a small litter (usually 4 or less) tend to have longer pregnancies than those that produce larger litters. Colony rabbits usually have a variety of nesting boxes available at all times. You will need at least one box per doe, plus a few spare. 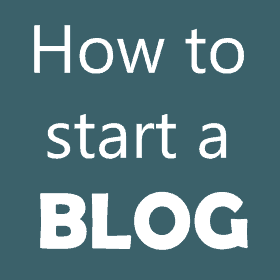 Birth is usually straightforward, and generally the does know what to do with the kits. Don’t panic if you never see them feed their babies, or they seem to have covered in the burrow. Remember rabbits are prey animals and they don’t want to lead you to their nest. Kits usually only feed twice a day and will stay in the nest for about 3 weeks. 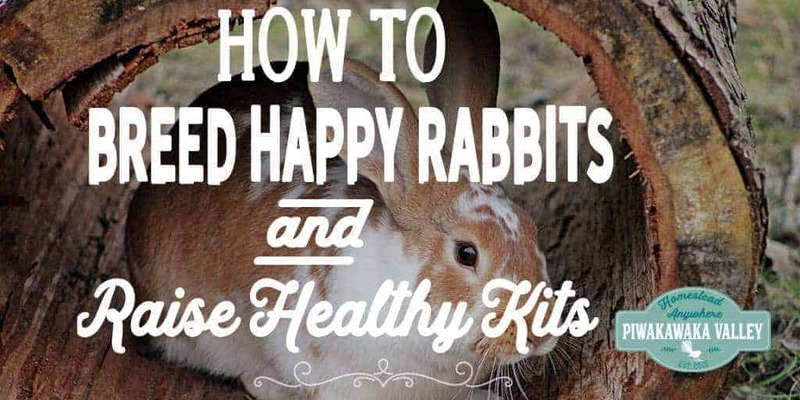 Related: How to breed happy rabbits and raise healthy kits. 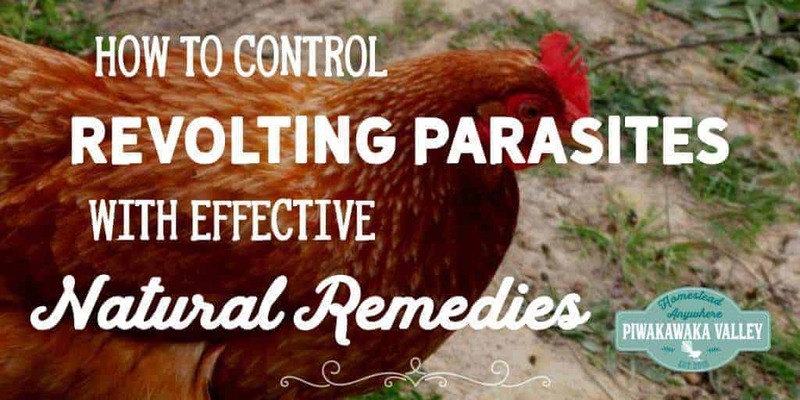 In permaculture they say that often the problem is the solution – got weeds in your veggie patch? They may well be suitable (free) rabbit food for feeding rabbits naturally! 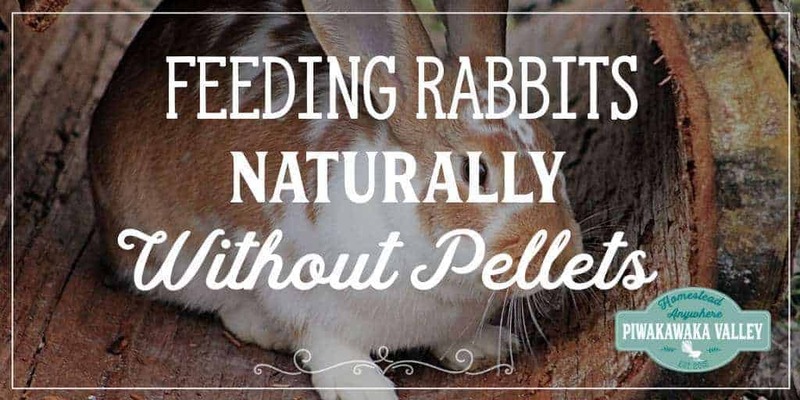 Pellets are an option for feeding rabbits. The pluses are they are a complete food, developed for optimum growth and they are convenient. The negatives are they are very pricey (up to twice the price of the individual components); they rely on a company not screwing up the nutrition and killing your pets; they are very processed and they have no variety; and you have to bring them in from off site. 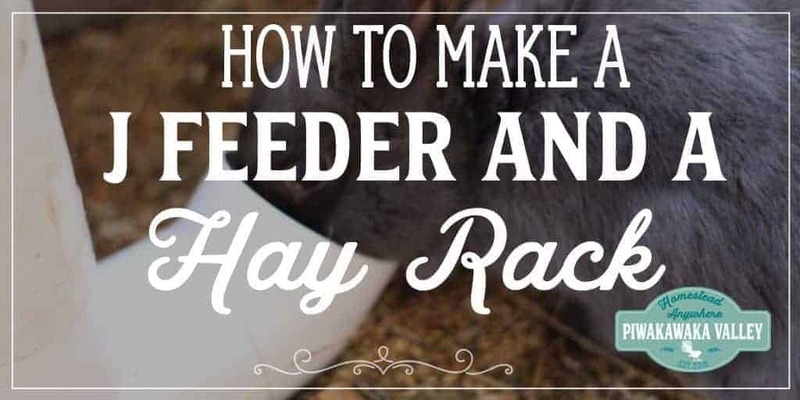 We feed our rabbits a mix of lucerne hay (alfalfa), whole barley, rolled/crushed oats with free access to meadow hay and a salt block. To this twice a day we add a range of fruit/vegetable/greens/weeds/grass for them to enjoy. We are aiming to get rid of the pallets all together once this current bag is eaten, and I would like to find a source of sunflower seeds for healthy oils to help keep their condition on for the cooler months. If you are going with dirt on the floor of your rabbit colony enclosure, there are several options for keeping the rabbits in. 1). Dig around the perimeter of your enclosure down at least 3-4 feet and put down either netting (will rust fairly quickly), corrugated iron (will rust after a few years) or heavy duty geotextile fabric (get the best, thickest that you can afford). Then backfill and fence well. 2). Use a solid floor enclosure like concrete, old pavers or chimney bricks. 3). Put down a thick, large stone, layer of gravel or rock fill. At least 1 ft deep. On top or under this you can put a layer of geotextile fabric or netting. Then you should cover the whole thing with a layer of dirt. 4). Put down netting, then around the perimeter put bricks or pavers to hold it down well – rabbits aren’t stupid as it turns out! Make sure it is a thick wire or they can bite through it. If you put a large pile of dirt in the centre of your colony you will encourage them to dig and nest in it rather than digging to escape. 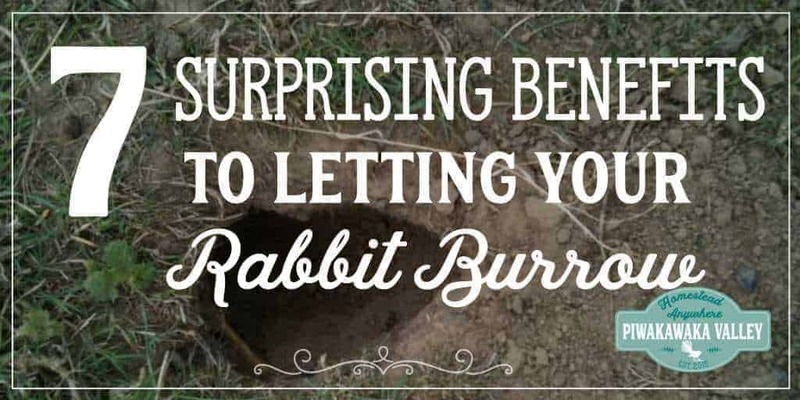 If you truly think that letting rabbits express their natural behaviour is the best way to get happy bunnies, then surely letting them burrow is also important? Burrows provide significant insulation – helping keep it cool in Summer and warm in Winter. Being prey animals, rabbits have a lot of predators. Hiding kits in a burrow makes them much harder to find. Mama bunnies are very clever and they clean out their burrows when they are finished with them. They are rigged to dig, and if you try and stop it by putting down netting or pavers, they will keep trying to find a spot to burrow in any way. All the rabbit’s instincts are to dig and hide, so if there is any way you can allow for this, I recommend that you do. 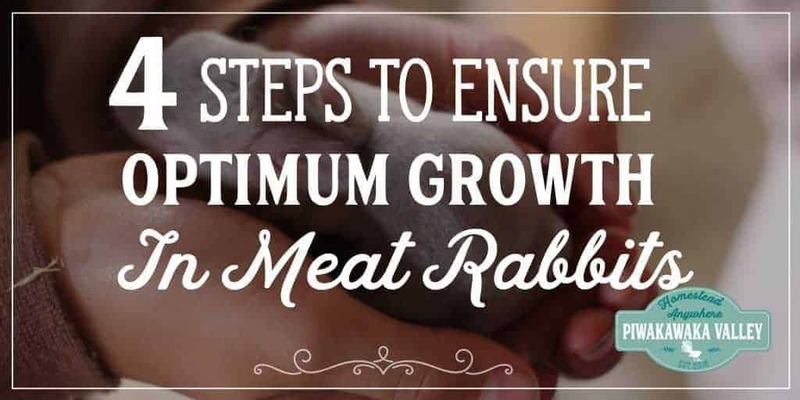 There are a few things that you can do to ensure your rabbits grow to their potential. Make sure they are warm, dry and well fed. Start with good stock, and cull bad breeders hard. Don’t keep anything sub-par. To breed up – select new breeding does by the weight they are at 4 weeks old. At 4 weeks a kit has only had mamas milk really and you want to select girls whose mama’s could make plenty of quality milk to grow babies. Select young bucks at 8 weeks – look for well proportioned bodies, with a good wide chest and meaty haunches. You are looking for a nice round shaped rabbit, not a long skinny one. You will need a few things – a method of dispatch (we prefer the broomstick method with a piece of 1/2 inch steel), a processing area, sharp knives (I like this one and this one), some rope to hang their feet with, a guts bucket, a dunking bucket or a hose to wet them down, a cooler full of cold water or ice and a warm bucket of water to wash your hands and knifes. The first time is not easy. Be thankful and respectful and observe the moment. You will get more used to it, but you aren’t supposed to enjoy killing things. Remember, rabbits are prey animals and they die easy, it isn’t going to be as difficult as you think it might be. And always keep a whacking stick/hammer at hand juuuuusssst incase. 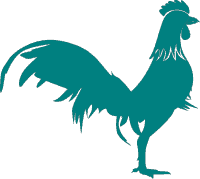 Choose your breeding stock from the best of the best that you have access to, and cull any stock that show illness/weakness. 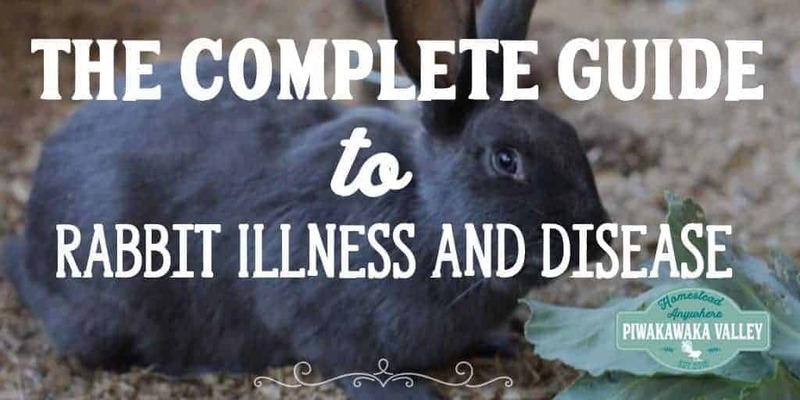 This will result in you having very little trouble with rabbit diseases in your rabbits. Good nutrition is the next most important pillar to preventing rabbit diseases in your rabbitry. 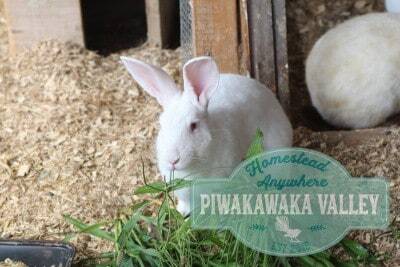 Ensure your rabbits get plenty of whole grains, fresh vegetables, unlimited hay, fresh water and a mineral supplement. Provide good housing and deal with ill animals swiftly. Prevention is better than cure. 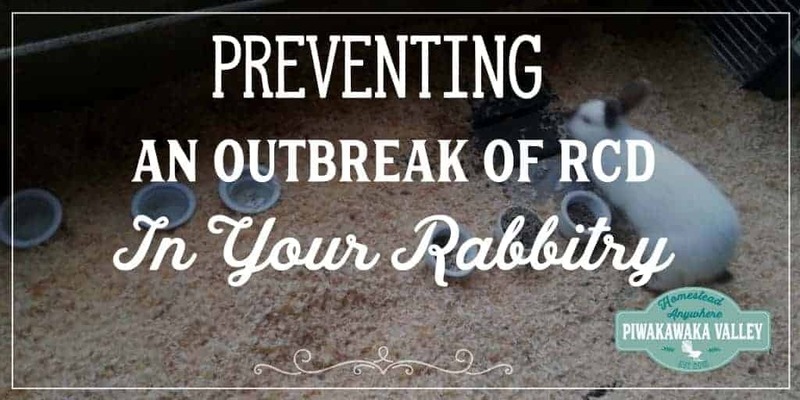 If there is an outbreak of anything in your area – follow this rabbitry lock-down protocol. 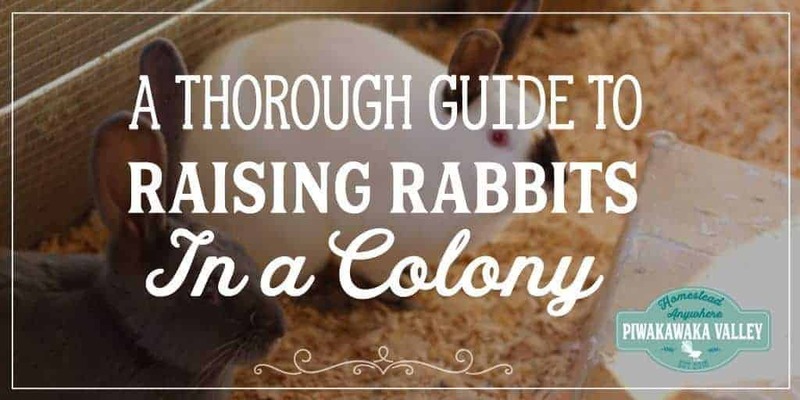 I hope you have found this ultimate guide to raising meat rabbits in a colony useful. There is a rabbit troubleshooting page in case you are having issues.